A lot of people believe that once the cold air arrives, their allergies will go away. While that may be true for some, this is not the case for everyone. Quite frequently, we tend to conclude that the symptoms we can experience during the harsh winter months are caused by either a cold or the flu. It can be difficult, at times, to distinguish the difference as many of the symptoms overlap. How can you be sure what you are dealing with? 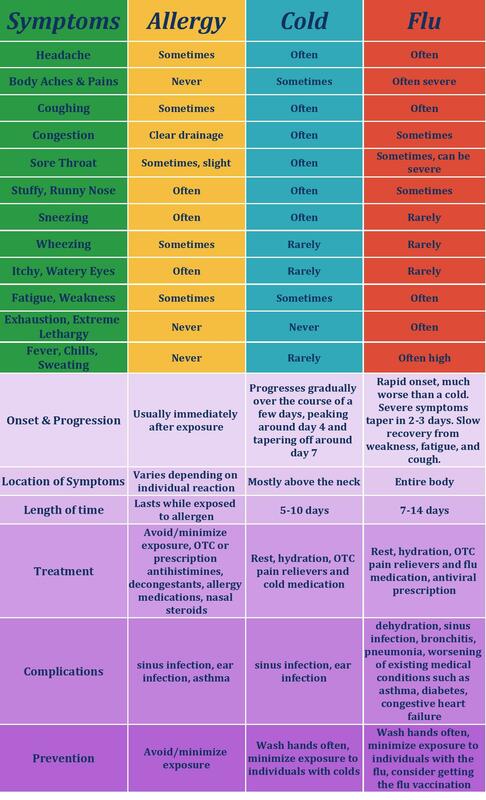 Understanding the variables can help you choose the right path of treatment and know whether you are going to be out of the woods relatively soon or if you are going down for the count. Here’s a breakdown comparison to help you narrow it down! So What’s The Deal With Winter Allergies? As people spend more time indoors during the winter months in general, indoor allergies become more prevalent as compared to the rest of the year when the outdoor air is the biggest contributor to allergies. As home furnaces kick in, dust, mold spores, and insect parts that have settled throughout the summer are dispersed into the air. These allergens can cause a histamine response in the immune system, causing watery eyes, runny noses, and other symptoms of an allergy or asthma attack. The most common winter allergy triggers are dust mites, mold, animals, and fragrances when it comes to indoor responses. Dust mites are microscopic bugs that are most commonly found in mattresses and bedding, and their waste and remains trigger allergic responses when they become airborne or when you come in contact with them. The spores of mold found in humid areas like bathrooms or basements can also trigger allergic responses. Many people think they are allergic to Christmas trees, for example, but really they are allergic to the mold spores that may have collected on them while in storage. Proteins found in pet hair, skin, saliva, and urine can also cause allergic reactions. Finally, many perfumes and colognes, as well as lotions, hairspray, air fresheners, candles, and potpourri can elicit reactions with people who have allergies to fragrances. There are many actions you can take in order to ease your winter allergies. They include taking antihistamines, decongestants, and allergy shots. Antihistamines are medicines that reduce sneezing, sniffling, and itching by blocking the effects of histamines in the body, and decongestants help clear mucus out of the nasal passageways. They can be used together to treat both symptoms of allergies. Allergy shots expose your body to gradually increasing doses of the allergen until you have time to grow to tolerate it. Filters serve the same main purpose in automobiles, vacuums, humidifiers, refrigerators, dryers, and your home furnace and air conditioner. Protection and removal of contaminants. In your HVAC system, the air filter is there to not only protect your system from harmful buildup on the internal components, but also to help keep the air in your home clean from dust and allergens. This is especially important during those harsh winter months where you are inside for longer periods of time and your house is kept closed to keep your warm air in and the cold air out. The benefits of clean, fresh air are particularly welcome in the winter season when it is more difficult to introduce fresh, outdoor air into the home. To help reduce those winter allergy triggers, make sure to replace your air filter regularly. If your allergies are particularly aggravated by the winter season, consider our highest-rated MERV 13 filters to capture the greatest percentage of microscopic contaminants. Not sure what size you need? Our air filter measurement guide can help! Choosing the filters that are just right for you and your family can be a challenge sometimes. At US Home Filter we understand this, which is why we are here to help answer any questions you may have and help ensure that you have chosen the proper size air filter that will fit perfectly. If you need personal assistance with selecting your home air filters, contact us now online or call us at (855) 237-1673. We care about our customers and guarantee your satisfaction! Take advantage of our quality MADE IN THE USA products, vast selection, low prices, and enjoy FREE SHIPPING on every air filter order within the Contiguous USA!